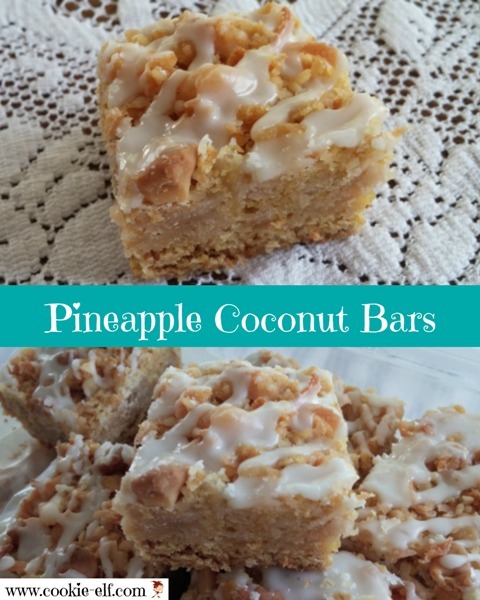 Don’t let the ingredient list for Pineapple Coconut Bars deter you. The cake mix makes the recipe easy to put together because the mix saves you steps. And while these bars have four layers, each layer has just a couple of ingredients. Each comes together quickly. Furthermore, this bar cookie recipe is not only a winner when it comes to simplicity, but also in nationwide popularity. It was a favorite in the iconic Pillsbury Bake-Off Contest #35 in 1992. Preheat oven to 350º F. Lightly grease 13 x 9 baking pan with vegetable spray. Or line the baking pan with aluminum foil, allowing ends of foil to extend over two sides of the pan, and coat the foil lightly with vegetable spray. In a large mixing bowl using an electric mixer on low speed, combine base ingredients until the mixture is crumbly: cake mix, oatmeal, butter, and egg. Measure 1 ½ cups of the crumb mixture and set it aside. Press the remaining crumb mixture into the bottom of the pan. In another bowl, stir together the filling ingredients: flour, sweetened condensed milk, crushed pineapple, and nutmeg. Pour filling over the crust. In a third bowl, combine 1 ½ cups crumb mixture, macadamia nuts, coconut, and vanilla baking chips. Sprinkle topping mixture evenly over filling. Bake the bars for 30-40 minutes or until golden brown. Remove bars from the oven and set them on a wire rack to cool completely, about 1 hour. When bars are cool, prepare the glaze. In a small bowl, stir together powdered sugar and enough reserved pineapple liquid until the mixture is smooth and thin enough to drizzle. Drizzle glaze over bars until the surface is thoroughly covered. Cut bars into 6 rows by 6 rows (or other size you prefer) and lift out of the pan with a metal spatula. Or if you lined the pan with foil, grasp ends of foil and lift the bars from the pan. Set bars on a cutting board, peel away foil, and cut. Set Pineapple Coconut Bars in an airtight container with waxed paper in between layers. Store bars in the refrigerator. To drain crushed pineapple thoroughly and save the juice for the glaze, set a bowl in the sink. Place a small colander over the bowl. Pour crushed pineapple into the colander, allowing the juice to drain into the bowl. Use a large spoon or a potato masher to press out excess juice from the fruit before adding it to the filling. A secret from The Elf: the recipe says to use separate mixing bowls for each layer, but The Elf reuses one bowl. Simply measure out the reserved crumb mixture in a measuring cup and set it aside between constructing layers. You’ll save time and mess.